Palinurus falls from the stern of a ship into the sea, the God of Sleep flies away with a branch in his hand. Engraving from a German children’s picture-book version of the Aeneid by G. J. Lang and G. C. Eimmart, 1688.
ignōrāre iubēs? Mēne huic cōnfīdere mōnstrō? nusquam āmittēbāt oculōsque sub astra tenēbat. tempora, cūnctantīque natantia lūmina solvit. ipse volāns tenuīs sē sustulit āles ad aurās. prōmissīsque patris Neptūnī interrita fertur. Palinurus is an unlucky soul struck down by fate and the gods so that Aeneas might reach destined Italy. 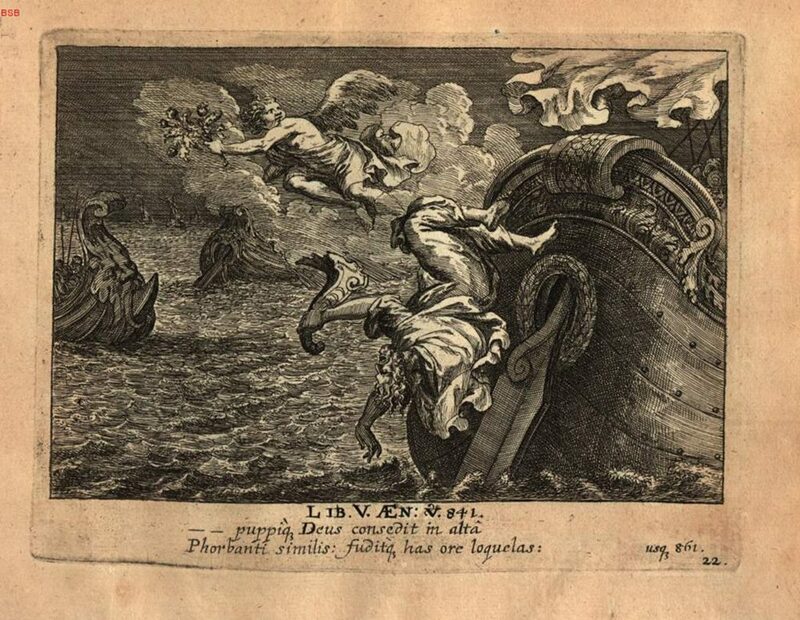 As Aeneas’ helmsman, he is visited by Somnus in the end of Book Five of the Aeneid, and is instructed to rest his eyes and let Somnus take over steering the fleet. However, Palinurus does not listen and is put to sleep by the god, and falls into the ocean. The reason why Palinurus dies in this manner is because earlier in Book Five, Neptune promises Venus that Aeneas will safely reach Latium on calm waters, but only if a single life in given in return. Palinurus’ main appearance is in Book Five, but he also makes an appearance in Book Six when Aeneas travels to the Underworld. During this scene, Palinurus begs Aeneas to give his bones a proper burial, and the Sibyl promises Palinurus that the people who discover Palinurus’ body “will appease your bones, will build you a tomb and pay your tomb due rites and the site will bear the name of Palinurus now and always” (Aeneid 6.379-80). But why is Palinurus unfairly chosen to die? Palinurus’ death fits into Vergilian pattern of death taking place at the end of books, or sections, of the Aeneid. In Book Two, Creusa dies in the final lines; in Book Three, Anchises does; and in Book Four, the final scene is the suicide of Dido. Not only do these characters all die at the end of these books, but their deaths in some way help Aeneas to arrive safely in Latium. They were all subject to fate and the intervention of the gods. This principle, as discussed by historian of religion Walter Burkert, is called pars pro toto, and it refers to “accepting the small loss in order to save the whole.” Vergil uses it because it “is highly rational [to employ] and highly emotional at the same time” (Burkert 51). Through his use of pars pro toto, Vergil creates a rather eerie and somber tone in this passage. Although Vergil uses a lot of adjectives noting how peaceful the ocean and sky were during Palinurus’ death, those like placidi, quietos, sereni, and liquidas to name a few, Palinurus dies vocantem socios nequiquam, “calling out to his comrades in vain,” while he is thrown headlong into the ocean, drowning without any “indication that anyone heard the helmsman’s cries” (Fratantuono, 719). This eerie tone is especially present when Vergil writes about how the fleet approached the crags of the Sirens, which were white with the bones of many men. Sirens are mythological creatures, half human, half bird who lived on cliff-sides and would lure passing travelers to them by singing pleasant songs. Then, they would wreck the approaching ships, killing the sailors (Hinz). This detail about the Sirens could have been omitted, but Vergil cleverly writes about the Sirens to enhance the somber tone of Palinurus’ death, as “sleep had to work quickly so as to ensure that Palinurus could be cast overboard as a quasi-offering to the Sirens” (Fratantuono, 721). Further adding to the eerie tone of this passage are Vergil’s final words in Aeneas’ epitaph to Palinurus at the end: ‘nudus in ignota, Palinure, iacebis harena’ (5.871). Palinurus will eventually wash up on the Italian shore, but Vergil notes that this shore will be ignota, or unknown. Palinurus is lost forever, and no matter how hard the Trojans search for Palinurus’ body, it will forever remain a mystery as to its whereabouts. Palinurus’ body is also nudus, or naked, stripped of its former Trojan distinction to whoever happens upon it. Vergil uses an eerie tone for this section because it complements the unfair fate of Palinurus. Everything seems to be going great for the Trojans after the games Aeneas holds for Anchises in Book Five, until Palinurus is unjustly chosen for death. The eerie tone in this passage also sends chills down your spine, forcing you to shudder at the dark fate of an innocent victim. Besides the tone, another aspect of Vergil’s portrayal of Palinurus which I find interesting is the dichotomy between his brief speech in the beginning of this section and Aeneas’ at the end. Palinurus makes it very evident that he does not trust the calm waves and the clear sky. Palinurus is an experienced helmsman, and would not easily be thrown overboard by the worsening of conditions. However, “in the last lines of the book Aeneas laments the steersman’s fate and comments, pathetically inappropriately as it seems in view of Palinurus’ earlier indignant refusal to trust the elements, that Palinurus died through overconfidence in the calm sea and sky” (Nicoll, 459). It seems odd for Vergil to credit Palinurus with being a great helmsman, only to have Aeneas discredit this distinction a mere twenty lines later. However, it is not uncommon for Aeneas to be ignorant of the facts, contrary to other epic heroes. When Aeneas is fighting for Troy in Book Two, for example, Venus has to come down to show him how the gods were destroying Troy and there was no hope in saving the city. Similarly, in the Underworld, Aeneas sees Dido for the first time since leaving Carthage and has no idea she killed herself because he left. Fortunately for Palinurus, Aeneas eventually realizes that divine foul-play was involved when he meets Palinurus in the Underworld. There are many instances in this passage which exemplify Vergil’s distinct style. He employs vocabulary in this section in order to generate a more epic emotion to the lines. In line 861, he uses ales (“bird,” literally “wing”) to describe Somnus flying away from Palinurus, instead of using more colloquial terms such as avis or volucris. Additionally, Vergil does not use mare even once to describe the ocean, instead opting to use the epic word aequor in line 862. For the other instances when Vergil mentions the ocean, he uses nouns such as salis, fluctus, and undas to describe features of the ocean, which further enhance the imagery of the scene, contributing to the epic feel. Another stylistic feature present within this passage which is characteristically Vergilian is the repetition of an idea using different sets of words. In Palinurus’ short speech alone there are two examples of repetition of the same idea. The first is in line 848: mene salis placidi vultum fluctusque quietos. Palinurus references the ocean twice in the adjective-noun pair salis placidi vultum and fluctus quietos. The example in Palinurus’ speech is in lines 850-51: Aenean credam (quid enim?) fallacibus auris et caeli totiens deceptus fraude sereni? This time fallacibus auris and caeli sereni describe the treachery of the weather. These two examples of repetition allow the reader to better picture the scenery Palinurus is currently experiencing, adding to the vividness of the poem. To summarize, this passage at the end of Book Five is dark, as it highlights the fated death of an innocent victim, while sticking to the Vergilian theme of death at the end of sequential books, or pars pro toto. Burkert, Walter. Creation of the Sacred: Tracks of Biology in Early Religions. Cambridge, MA: Harvard University Press, 1996. Fagles, Robert, trans. Virgil: The Aeneid. London: Penguin, 2010. Fratantuono, Lee, and R. Alden Smith. Vergil: Aeneid 5: Text, Translation, and Commentary. Leiden: Brill, 2015. Hinz, Berthold, “Sirens.” In Maria Moog-Grunewald, ed., Brill’s New Pauly Supplements I – Volume 4: The Reception of Myth and Mythology. Nicoll, W. S. M. “The Sacrifice of Palinurus.” Classical Quarterly 38 (1988): 459–72. Thomas, Richard F., Jan M. Ziolkowski, Anna Bonnell-Freidin, Christian Flow, and Michael B. Sullivan. The Virgil Encyclopedia. Malden: Wiley Blackwell, 2014. Hugh Downs discusses the character of Misenus in Vergil’s Aeneid. Triton. Bronze sculpture by Giambologna, 1560-70. Metropolitan Museum, New York. There are many stories in Roman mythology that involve mortals challenging the gods to contests. One of the best known is the tale of Arachne, the weaver who thought she was better than Minerva. Another less well-known story is that of Marsyas and Apollo. Marsyas was a satyr who challenged Apollo to a music contest but lost. More often than not, these stories do not end happily for the mortals. Arachne was turned into a spider and Marsyas was tied to a tree and flayed alive. This podcast will focus on another, more obscure character who challenged the gods and faced their wrath: Misenus, Aeneas’ herald. et lituō pugnās īnsignis obībat et hastā. inter saxa virum spūmōsā immerserat undā. dīcitur aeternumque tenet per saecula nōmen. they found Misenus cold in undeserved death on the dry sand. And inciting Mars with a trumpet’s call. For fighting around the prince with both horn and spear. Misenus, most brave of heroes, fell in with Dardan Aeneas, equal of Hector. With a hollow conch, he recklessly challenged the gods to a contest of song. And among the rocks drowned him in the crashing waves. called Misenum and will hold that name for all time. There are some contextual notes that I’d like to make which I think will be helpful for better understanding the section. Aeolus, Misenus’ father, was the keeper of the winds, so it is fitting that his son should be a renowned trumpeter. The conch was Triton’s “special instrument” (Austin, 91). so it makes sense that he specifically would punish any mortal who dared to challenge the gods with it. 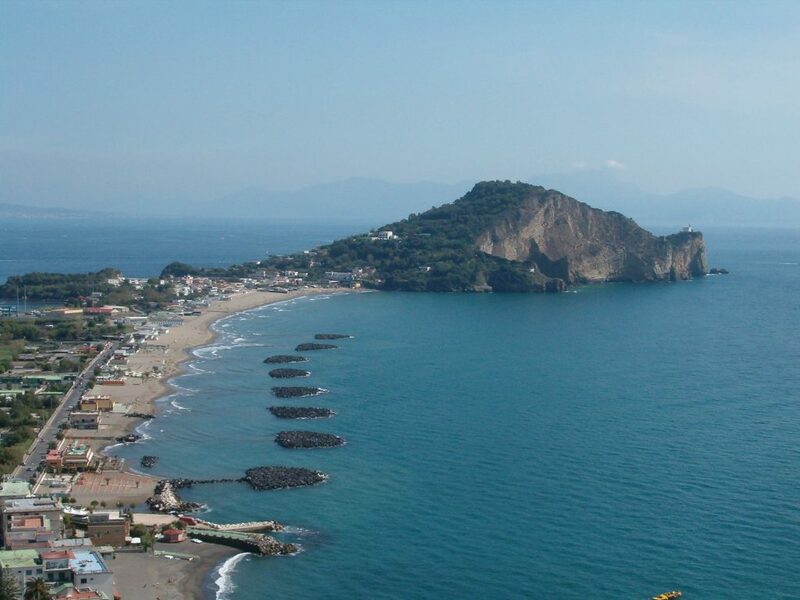 The place referred to here at the end is the modern day Cape Miseno, the northwest headland of the Bay of Naples. During Vergil’s time it was a popular vacation spot for Rome’s elite and housed many luxurious villas (Ganiban, 833). It was also the site of an important naval base during Augustus’ reign (McKay, 8). The topography of the cape lends itself to Vergil’s tale of Misenus as it bears a striking resemblance to a burial mound. The sounds the wind makes as it travels across the landscape through caves and grass are said to resemble to some degree those of a trumpet, strengthening the connection to Misenus (McKay, 7). By placing the death of Misenus here, Vergil is providing a link between the mythical past of his poem and the present day (Austin, 108). His Roman audience would have been very familiar with Cape Miseno, and making this connection would help them visualize and connect with the story more. These lines provide us with good examples of many stylistic features common to Vergil. For one thing, Vergil very often uses words that “are more at home in poetry than prose”; these “add to the grandeur” of the poem and serve to make it feel truly epic (O’Hara, 255). Sicco; peremptum; lituo; obibat; aequora; spumosa; and immerserat are all examples of words found much more often in poetry than prose. Another common stylistic feature found in these lines are assonance and alliteration. Alliteration had been used in Roman poetry long before Vergil came onto the scene, and Vergil uses it sparingly so as not to appear archaic (O’Hara, 252). vita victor spoliavit in line 168 is a good example of alliteration with the v’s, and line 165 contains both alliteration and assonance in aere ciere…accendere cantu. The latter is especially interesting as Vergil uses the devices to imitate to some degree the trumpeting of Misenus (Austin, 90). Epanalepsis can also be found in this section. This is the unnecessary repetition of a word or phrase from a previous line so as to linger over an idea to add pathos or emphasis (O’Hara 253). This is seen with the repetition of Misenum in the first 3 lines. There is also repetition with Hectoris…Hectora in line 166, which serves both as a reminder of “Trojan pride and sorrow” and to emphasize the honored position Misenus held (Austin, 91). The reason I like the Misenus story (apart from the fact that he’s a literal blowhard), is the message it conveys about the relationship between gods and man. The story, like those of Arachne and Marsyas, shows that the gods thought themselves superior to man and did not take lightly to mortal challenges. Nor did they have any qualms about killing mortals who challenged their power. I think this humanizes the gods to a certain extent, because it shows that they could be petty too, just like humans. Thank you for listening, and I hope you now understand more about the character and significance of Misenus! Austin, R.G. P. Vergili Maronis Aeneidos, Liber Sextus. Oxford: Clarendon Press, 1986. Ganiban, Randal. “Misenus,” in Richard Thomas and Jan M. Ziolkowski, eds. The Virgil Encyclopedia, vol. 2. (Chichester, West Sussex, UK : Wiley Blackwell, 2014), 833. McKay, Alexander G. “Aeneas’ Landfalls in Hesperia.” Greece & Rome 14 (1967): 3–11. O’Hara, James. “Virgil’s Style,” in The Cambridge Companion to Virgil, Charles Martindale, ed. Cambridge: Cambridge University Press, 1997. Michelle Hoffer discusses Creusa’s farewell speech to Aeneas near the end of Book 2 of Vergil’s Aeneid. 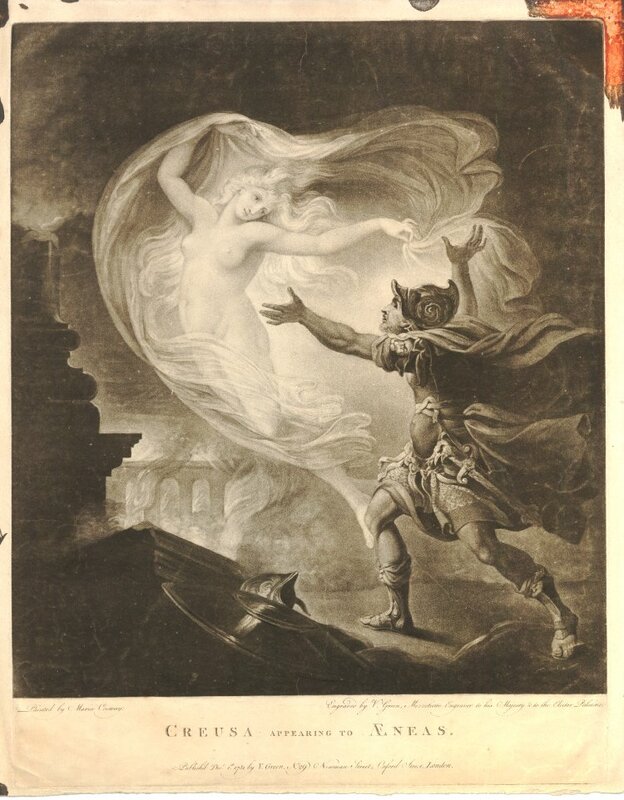 Creusa Appearing to Aeneas (print published in London in 1781, after a painting by Maria Cosway). Aeneas, in armour, staring up on the right, stepping forward to the left and throwing his arms out to try and embrace Creusa, who floats in mid-air, naked holding a veil billowing around her and looking down to the right at him, in the background, Troy burns. Source: The British Museum. fās, aut ille sinit superī rēgnātor Olympī. inter opīma virum lēnī fluit agmine Thybris. parta tibī; lacrimās dīlēctae pelle Creǖsae. sed mē magna deum genetrīx hīs dētinet ōrīs. Did she trip and fall over burning wood and lose sight of him? Was she grabbed from behind by a Greek and stabbed through the heart? Did she cry out his name as he became smaller in the distance? Did the blazing walls of a nearby house collapse on her as she fled? Or could she simply just not keep up? These are questions that we will never have the answers to, because as Aeneas and his family fled the burning Troy he told his wife to follow him “at a distance” and never looked back to make sure she was safe until it was too late. For this, he bears not only the guilt he takes on himself, but the blame of generations of readers who cannot understand why he did not protect her, why he did not let her go in front, why he did not look back. However, this is not the reputation he deserves, at least not in Creusa’s eyes. If you look closely at the words she chooses in her farewell speech, like dulcis, comitem, dilectae and nati communis amorem, it becomes clear that these two shatter the stereotype of Roman husbands being tyrants over their wives. These two were in love. That much is clear through her words. There is a deep emotional connection embedded in this speech and it paints a picture for the reader of the love they shared, helping us to feel the pain of his loss. Creusa, daughter of King Priam and Queen Hecuba, was Aeneas’ Trojan wife whom he loses as he flees the burning city with his father and son, asking her to follow them longē or “at a distance” (2.711). Aeneas only realizes that he has lost her when he arrives at the meeting point outside the city, and immediately rushes back, only to be confronted by her shade, who delivers a moving and prophetic speech before her spirit disappears from sight. While Creusa’s final speech is the only real window we have into her character, we are provided a telling glimpse into who she was as a wife, mother, and catalyst for Aeneas’ fateful journey. While Vergil is well known for modeling his works on those of his great predecessor Homer, Homer himself “does not have any character named Creusa, nor does he include any mention of a wife of Aeneas” (Cassali, 312). In fact the “name Creusa for the wife of Aeneas is not attested before the Augustan age”, in which both Dionysius of Halicarnassus and Livy mention her in their respective works (ibid.). In some of the earliest versions of the myth, Aeneas’ wife is named Eurydica, but “perhaps feeling that the name could not be dissociated from the Orpheus legend, Vergil accepted the account that her name was Creusa” (Briggs, 43). However, while Vergil may have accepted this origin, there are many textual clues that suggest the story of Orpheus and Eurydice was not far from his mind. Although Aeneas seems, at least on the surface, to be to blame for Creusa’s death, it is apparent in her speech that she does not see it this way, as she speaks gently and without resentment to her dulcis coniunx (2.776). She not only tries to soothe his guilt by reminding him that “these things did not happen without divine will” (non haec sine numine divum eveniunt, 2.776) but also by revealing that through her death she escaped becoming a slave to the Greeks, and instead now rests in the company of the gods. While he will move on, “she will remain in her homeland Troy” (Khan 2001, 909), and seems to be at peace with that. She is not resentful of his future happiness, but instead seems to take comfort in knowing that he will find happiness in the terram Hesperiam (2.781). In this way, her speech “is a combination of farewell, consolatio to assuage Aeneas’ guilt (not sharpen or prolong it), and divinatio, to point his way ahead” (Jones, 291). She concludes her speech with the same gentleness with which it began, asking Aeneas to “preserve your love for our son” (2.789). She knows that the road ahead for her husband is a difficult one, but even still, “she ends by telling him not to fail in his love for their son” (Jones, 291), as she knows he will soon enough be taking a new wife. In her final words, Vergil shows us that above all else, she was a concerned mother, putting her son’s life and future at the forefront of both her and her husband’s mind. She also uses the word communis (2.789) meaning “common” or “shared,” perhaps in an attempt to remind him that part of her will forever live on in this person they created together, and that to preserve his love for their son is to preserve his love for her also. While many would consider Creusa to be a minor character of the epic, I feel that she is the catalyst for the journey ahead. She needs to die so that Aeneas can fulfill his preordained destiny, and he must be forced to confront her shade so that he knows unequivocally that he has her blessing to move on without her, that he can go on knowing that she is not in pain, but in the company of the divine. She is able to put him at peace, a beloved voice telling him that perils await, but joy is inevitable. It is only through her encouragement that he is able to leave his burning city to pursue the numen divum. Briggs, Ward W. “Eurydice, Venus, and Creusa: A Note on Structure in Vergil.” Vergilius 25 (1979): 43–45. Casali, Sergio. “Creusa.” In Richard Thomas and Jan M. Ziolkowski, eds., The Vergil Encyclopedia, 3 vols. (Malden, MA: Wiley-Blackwell, 2014), 312–13. Grillo, Luca. “Leaving Troy and Creusa: Reflections on Aeneas’ Flight.” Classical Journal 106 (2010): 43–68. Jones, Peter. Reading Vergil: Aeneid I and II. Cambridge: Cambridge University Press, 2011. Khan, H. Akbar. “Exile and the Kingdom: Creusa’s Revelations and Aeneas’ Departure from Troy.” Latomus 60 (2001): 906–15. William Boyes discusses the character of Misenus in Vergil’s Aeneid. Most people aim to leave a mark on this world before they leave it, whether in the form of having children, or in their career, or contribution to some social movement. But very few can hope for an entire location named after us post mortem. We count among these famous few some of the most influential and important members of society to date: George Washington, Saint Francis, Milton Hershey. Nowadays you have to be a titan of industry, lead a revolution, or effect major social change to get your own hill or street. But Vergil’s Italy, all you had to do it seemed was just die near Aeneas. The Aeneid succeeds on its own terms as a beautifully composed epic in Latin, but it also provides explanations for the state of many things in the Roman world. Vergil knits together local myths and historical accounts in a wat that gives parts the Italian peninsula itself a kind of legendary gravity. For example, Aeneas’s helmsman Palinurus and his nurse Caieta both give names to capes and peninsulas in Italy. it comes et paribus cūrīs vēstīgia fīgit. Leaving the cavern, Aeneas walked with his eyes cast downward, his face sorrowful, pondering these strange dark events in his mind. Trusty Achates went with him as a comrade and locked with his captain both his step and his thought. They spoke about many different topics among themselves, what dead comrade did the princess mean? Whose body was left to be buried? When they came to the beach, they saw Misenus on the dry sand, dead, cutoff by a death all undeserved. Misenus, son of Aeolus, than whom no one was more outstanding at rousing men and in igniting the war god with his bronze trumpet. He had been the companion of great Hector. Around Hector Misenus met battles. He was distinguished with both war-horn and spear. After victorious Achilles stripped Hector of life, the very brave hero had come into the company of Dardanian Aeneas, then following a leader no worse than he had before. 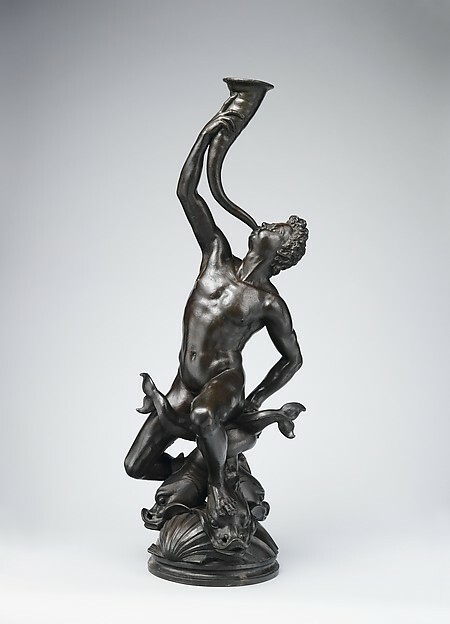 But then, while he happened to be playing his conch, making the seas resound loudly with his music- the fool- he called the gods into competition with his song and, if the story is to be believed, envious Triton snatched him up and drowned the man in the frothy waves among the rocks. This passage is packed with information about Misenus, filling in his backstory from before the Trojan War up until his death. We learn he is a tested fighter, but he is mostly a hype guy for great heroes like Hector and Aeneas, and he is great because he himself is in the company of great men. This point is emphasized by the repetition of Hector’s name, in addition to the names of other great men like Achilles and Aeneas, in line 166. Misenus was described as “very brave” and “outstanding at rousing men” to war—then later a close companion of Aeneas. Vergil also makes a point to paint the image of Misenus with great liveliness and youth, to make his death that much more tragic. Vergil’s main objective throughout the Aeneid, but especially in the little vignettes he sprinkles throughout the work, is to throw the reader into the emotional turmoil his own characters feel on their journey. In a different part of the Aeneid, Vergil subjects us to Priam’s gruesome and tragic death at the hands of Neoptolemus. This scene is particularly emotional because it involves old Priam being ripped from his family, still trembling under the weight of his old armor, and run through with a sword in a pool of his young son’s own blood. Compare these episodes also to Aeneas’s painful and protracted relational fight with Dido about leaving Carthage. Dido begs and pleads and clings to Aeneas hard as a lover should, but to no avail. She kills herself shortly after Aeneas leaves, in pain so great that nothing but death could relieve her. Each anecdote achieves the same end, in different ways: Vergil brings us a difficult and complex human experience we all find ourselves relating to in some way or another. The gods, as the ultimate arbiters of our fates, are seen as cruel and even shallow by the text—it seems completely unnecessary for a powerful sea god like Triton to snuff out a young, vibrant soul such as Misenus’s, just for playing a conch shell. The emphasis in this element is on the randomness of life’s misery. His name is repeated at lines 162, then 164 to heighten the emotional effect on Aeneas and Achates—and the reader. This technique is common in poetry, as in the line from Robert Frost: “Possessing what we were still unpossessed by, Possessed by what we now no more Possessed” (from “The Gift Outright”). Misenus’s value and purity in the world remind the reader of the cruelty the fates seem to spin for each of us, and even can be framed in reference to the sacrifices made in war or any great undertaking. One scholar (McKay) suggests that Misenus, along with the unfortunate helmsman Palinurus, are consumed by the “destiny that embraces Aeneas and Ascanius” as “quasi-sacrificial victims.” To achieve anything so great as the Roman Empire, sacrifices such as Misenus dying must be made. Another scholar (Dinter) likens Misenus to old Trojan glory lost and soon to be re-established. Misenus helps to bridge two continents, going from being very much involved with the old Trojan way, as Hector’s loyal trumpeter, to dying and being buried on Italian soil. He, like the Trojan identity he represents, must be disintegrated and sown into Italian ground, for Roman crop to arise. He even holds a place in both Phrygian myth and Roman history. Minor Heroes like Misenus exist in literature to enhance and move the stories of greater epic heroes like Aeneas, even if that means their sacrifice. However, I wonder whether the ancients meant to comment on the irrelevance or auxiliary nature of some people’s lives? Do the fates require sacrifice of some to ensure the glory of others, even now? Has destiny confined many of us to live only in the shadows of great men and women? Vergil doesn’t seem to give us an optimistic answer. This hard truth would certainly fit with his lessons in life’s many hardships. Dinter, M. “Epic and Epigram: Minor Heroes in Vergil’s Aeneid.” Classical Quarterly 55 (2005): 153–169. McKay, A. G. “Vergilian Heroes and Toponymy. Palinurus and Misenus.” In H.D. Evjen, ed., Mnemai. Classical studies in memory of Karl K. Hulley (Atlanta: Scholars Press, 1984), 121–137.